Forget simple fencing: your next fence deserves to be both beautiful and secure! Rustic Fence is proud to present beautifully crafted wood and iron fences that both look great and protect against outside forces. These combination fences are handcrafted to your property’s exact specifications. Wood and iron fences combine two of the most common fencing materials to create a strong yet artful fence. Ideally, these are used around front yards, parks, or even inside of cafes. Depending on your desired style, the fence can be wooden with an iron walkway, wooden with iron ornamentals, or any combination found in your imagination! An iron crossed fence with wood borders can be great for a dog park or daycare, while a wooden privacy fence with iron reinforcement is guaranteed to last through any wear and tear. 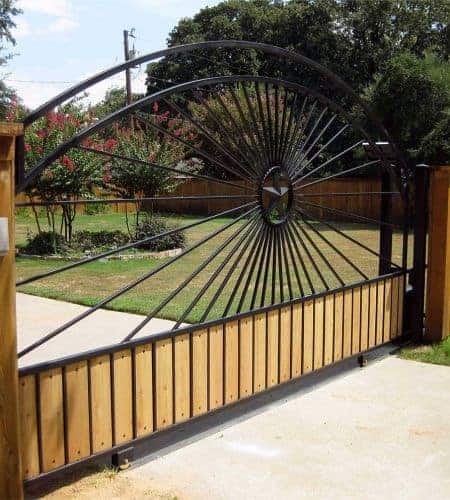 We can also design unique iron and wood combo fences featuring beautiful woods mounted on iron bars. Depending on the intended purpose of the fence along with your aesthetic tastes, the sky is the limit for what can be created!